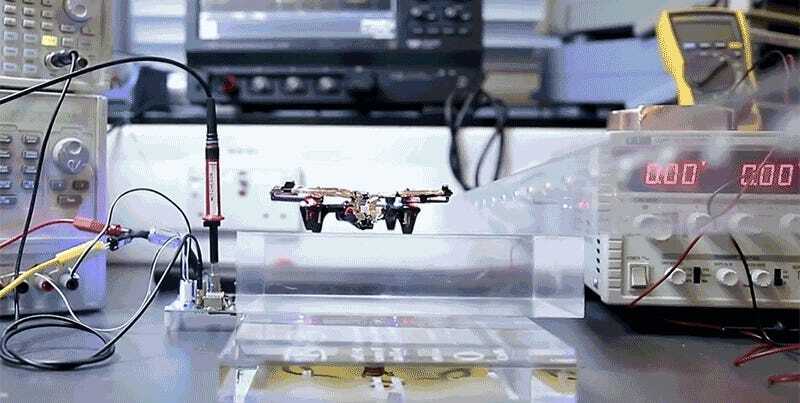 Dr. Samer Aldhaher, of the Imperial College London, created this simple demonstration of a lightweight battery-less drone hovering in place, powered only by the wireless power transmitter beneath it. There’s custom hardware at play here, given the wear and tear that the high-speed power switching technology puts on the electronics, but it works, and it’s another wonderful step towards ditching batteries altogether. Just don’t expect this particular quadcopter to make a cross-country flight without batteries in tow, though. This tech demo only has the drone flying about five inches above its wireless power base, with minor side-to-side movements. There’s still a lot of work to be done, and extensive infrastructure required for this drone to even fly all the way across the room. Wireless power technology is still in its infancy, but as we saw at CES earlier this year, it’s definitely coming—just not fast enough.